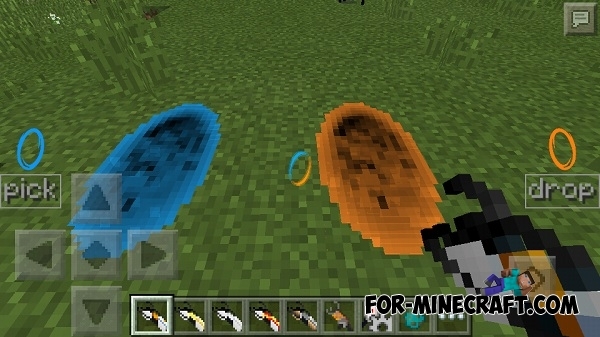 Now you can create real portals in Minecraft PE and that's not all features of the mod. More than 20 different items are at your disposal, with which the game will turn into something special. You will be able to teleport, move mobs, use useful things, listen to music and craft unique mechanisms. If you have played the Portal game, then you will like then the Portal 2 mod. Updated creation of portals, it is more convenient than before. Fixes related to the turrets, and more. How to install the Portal 2 mod? This mod has .modpkg format so installation is fairly simple. Click on the wrench and import the downloaded mod (ModPE section). The mod consists of several main items, each performs a specific task. Let's start from the beginning. And the first thing you get is the Portal Gun. This is a gun that puts the portals through which we can travel. To put the blue \ orange portal, tap on the blue \ orange rings on both sides of the screen. Then just go into the portal, and oh, a miracle will happenand. 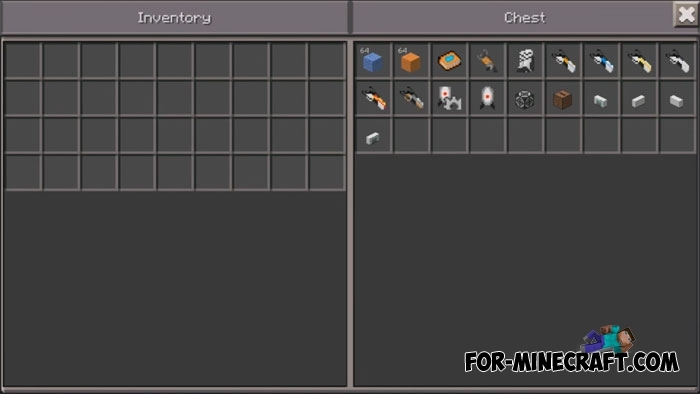 Actually this is a very cool thing, try to use it in mines. The next thing is the Gravity Gun, it allows to move mobs. To move a mob in any place you want, you need to tap on it. To release the mobs you need to press the drop or shoot button. So you can easily move creatures whether it is your home. Another great thing is the turret, u can enable / disable it. To do this you need to place it, and tap on the it (take a thing like a turret with pinion). Turret attacks all mobs that are close to her (if activated aggressive mode). If you do not want to die after falling from a certain height, then put super boots. The mod also adds gel blocks of two types. The first block is used for the high jump, the second one for acceleration. These blocks are perfect for making surf maps. Radio! To enable it, you need to tap on it (like other things), then you will hear music. 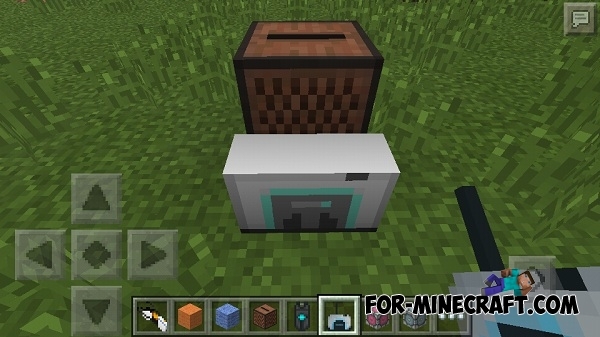 Tap again to turn off the radio (radio turn itself off if you move away from it at a certain distance). Jumpy plate. You fly up if you stand on it. This item can also be used in a variety of mini-games or a quick rise on the mountain. Music player (jukebox) and 3 plates for it. It's all quite simple and clear. 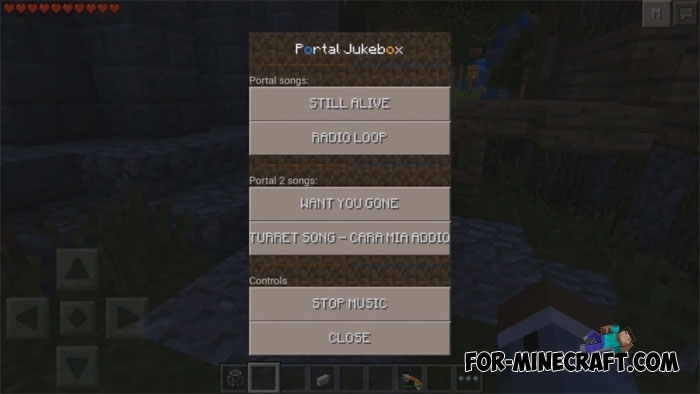 - Copy the "portal-music" folder in "sdcard/games/com.mojang/" folder. - Import the script (.js file) from local storage in Blocklauncher and enable it. I dont know to download this mod,help please!